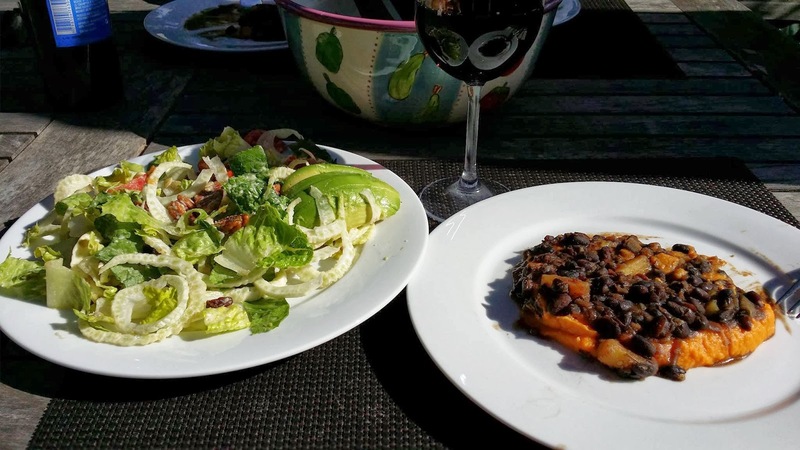 Here's a black bean recipe that I prepared for lunch on the weekend. I had just cooked a big batch of black beans in my pressure cooker so turned to my copy of Kathy Hester's "The Great Vegan Bean Book" to find some ideas. I was hungry and wanted something extra tasty and satisfying to go with the big salad I was planning. I guess you could say that the recipe is Caribbean/Cuban inspired as it has pineapple and rum in it. The cool thing is that I happened to have pineapple-flavored rum in my liquor cabinet, and I have no idea where it came from! At Hester's recommendation I also cooked her recipe for coconut lime mashed sweet potatoes on which I placed the beans. Here's a picture I took to give you an idea of how it looked. I had already eaten half when I thought that I just had to share this recipe and needed a picture, so had to tidy up the plate a little bit for the photo. LOL! Serve the beans on top of the mashed sweet potatoes. I only used 1/8 tsp cayenne pepper but I think it could have done with a little more heat. Next time I'll use 1 fresh jalapeno pepper. This is a great recipe. Combine it with a hearty salad and you have something that will impress guests too. Beans are a staple for all of us who follow a whole-food plant-based lifestyle. I really recommend Kathy Hester's book - it is crammed full of delicious and easy to prepare bean recipes. You can order The Great Vegan Bean Book from Amazon.